The spatial resolution of an optical microscope has for long been restricted by the diffraction limit. Recent advances in fluorescence imaging (Nobelprize Chemistry 2014) now enable the localization of single fluorescent molecules with ~20 nm precision and subsequently images can be constructed by so called “super-resolution microscopy” (SRM) techniques. Although the spatial resolution of electron microscopy is not reached, SRM has much less impact on the sample. It therefore allows for in vivo imaging with roughly 10-fold better spatial resolution than confocal microscopy. 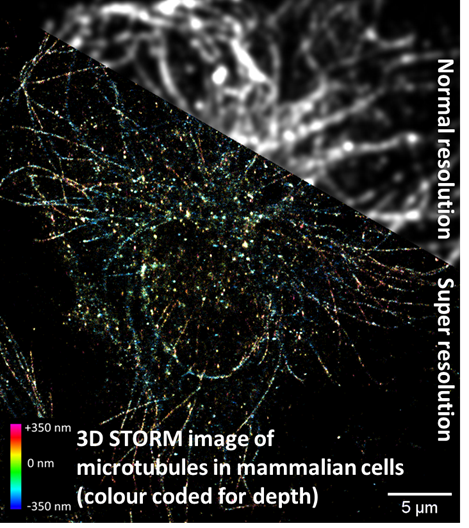 The methods used to achieve this are Stochastic optical reconstruction microscopy (STORM) and photo activated localization microscopy (PALM). The home built and designed microscope is based on the MiCube concept. 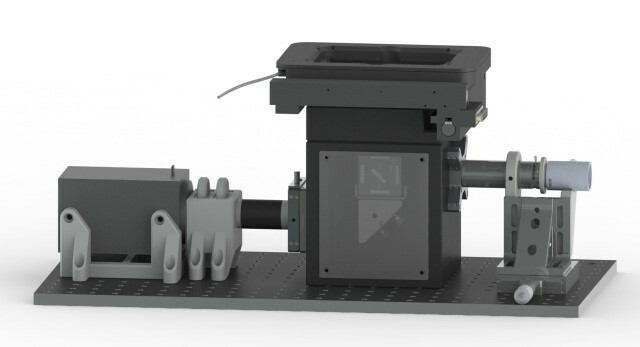 A fibre coupled laser box (Omicron: 60mW 405nm, 200mW 488nm, 500mW 561, 400mW 638nm) enters a Total Internal Reflection Fluorescence (TIRF) illuminator. The light is focused in the back focal plane of a Nikon CFI SR HP Apochromat TIRF 100XC Oil objective. Focusing in the centre allows for wide-field fluorescence excitation. By displacing this focus off-centre an evanescent excitation field is created that selectively excites a thin layer close to the surface of a cover glass (i.e. TIRF-mode, which suppresses out-of-focus fluorescence). Epi-fluorescence is projected on a Andor Zyla 4.2 PLUS sCMOS camera. The microscope stage is compatible with regular cover glasses as well as well plates, and a stage top incubation chamber is available at the MicroSpectrosCopic research facility (MSC) upon request. This microscope can be used for imaging all sort of samples, but is especially useful when regular fluorescence microscopy has insufficient resolving power and the sample preparation in electron microscopy has too much impact on the sample. The main restriction compared to e.g. CLSM is that specific fluorescent photoswitchable probes have to be used, and imaging protocols are more stringent. But under the right conditions, it can be used to e.g. track single molecules with sub-millisecond time and sub-nanometer spatial resolution in living cells. Contact the MicroSpectrosCopic research facility (MSC) for more information and assistance with sample preparation. Article "How the optical microscope became a nanoscope"